Temperatures on Saturday: Hottest maximum and hottest minimum in India was Kurnool at 42.5c, with the minimum at 29c. Followed by Bhubaneshwar at 42.0c and Tiruchchirapalli at 41.8c. Almost all in the deep Red zone marked in Thursday's weekend forecast. In Pakistan too, as forecasted, the Sindh region is heating up, with Nawabshah the hottest at 40.0c. In Nepal it was Dipayal at 36.4c. Kathmandu was a pleasant 29.5c and night at 9.4c. The forecasted low has formed in the LWD in around South interior AP. Low is at 1000 mb. Posted on Friday @ 10.15pm IST: The weak trough in Central India is likely to shift East, running from East MP thru Vidarbha/Chattigarh and AP. A weak Low embedded in the trough may form in Southern AP by Saturday night.Low may survive only for 24 hrs in Central/Southern AP. Closely behind is another WD, A-2. The trough from the system will bring rains on Saturday 6th April to Dubai. Saturday night and Sunday 7th day time will see precipitation and cloudy weather for Muscat. Sunday night sees fairly heavy rains aalong the Gwadar coast of Southern Pakistan. Sunday night and Monday 8th, morning, heavy thundershowers with squally winds can be expected in Karachi. Sukkur can get a thundershower and Hyderabad will be cloudy with chance of a shower on Monday 8th April. Weekend rains will be subdued in Southern peninsula and rest of India. A-2 moves into Indian region from Tuesday 9th April. 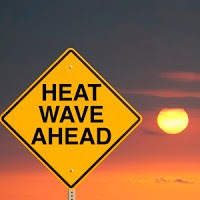 Heat Wave likely in Vidharbha and adjoining AP regions. Temperatures in AP and Vidharbha likely to touch 43c by Sunday. Mumbai: Partly cloudy mornings. Temperatures around 32-21c (Scruz). Humidity increasing and creating more sweaty conditions. Humidity increasing, and sweaty conditions start. Outer townships will have cloudy mornings with warm days around 37c. Pune: Very sunny and hot weekend with temperature touching 39/40c. Nagpur: Partly cloudy with afternoon convection. But hot day, possibly touching 42c by Sunday. Delhi NCR: Sunny weekend, with rise in day temperatures. Expected to reach 37c by Sunday. Kolkata: Partly cloudy with mercury touching 39/40c by Sunday. Surat: Hot and sunny. Saturday will be around 36/37c. Sunday will see good westerly breeze. Confirmed Vagarians are as follow : Rajesh Kapadia, GSB, Abhijit Modak, Rohit Aroskar, Puneet Bangera, Junaid T Golandaz, Salil Kawli, Ameya Swar, Pavan Gudee. Waiting for confirmation from Ronnie Bhaumik, Sam, NT & Mohan Krishnan !! Also Vagarians from other cities are most welcome for the meeting.. So if possible then please join us for the Thane meeting. All Vagarians are most welcome. I had followed your 2012 monsoon watch and it was most informative. Look forward to MW 2013! Look forward to your monsoon watch series.. The 2012 monsoon was most informative and really helpped me learn a lot abt the nuts and bolts of what makes the monsoons. Watching it unfold was a great learning experience. Its april and the season low ought to start taking shape in the next fortnight over barmer/sindh. Looking forward to monsoon watch 2013. Jayan: yes, our annual Monsoon Watch series starts every year on 10th April. This year too it will be on schedule. BTW , where are you from ? Chennai max temp for today : NGBKM 36.5c, MNBKM 38c. So Chennai also heated up today..
Kodaikanal max temp 22.8c for today. Bangalore max temp 35.4c today. Rajkot max temp 39.3c & Surat max temp 35.9c today. Rajkot max temp 39.3c & Surat max temp 34c today. BANG has consitently remained above 35deg for most of MAR and APR will touch 39. This is mainly due to consistent heat wave @ Rayalseema - Anantpur which remained above 40deg since start of MAR. BANG very near to Anantpur heat wave just sweeps in. Another main reason BANG has complete loss of good old heritage trees and lakes. With 3 years of drought situation worsens. As per KAR weather divisions BANG MAR was hottest in 50years!!! Even few mm of pre-monsoon showers are mere trickle, worst part during proper monsoon months BANG never receives any rains (jun-sept) winds just sweep clouds and usual weakening NEM current fail to bring any relief to parched place. Its a surprise that Dipayal is the hottest in Nepal; overtaking the usual culprits like Nepalgunj, Bhairahawa and Dhangadi.